Your heart will be racing as they direct you to one of three swim platforms, which you will share with about 25 others waiting for a dolphin kiss. Small groups of ten will enter waist-deep water where you will have the chance to interact with the dolphins, being able to hug and feed them. 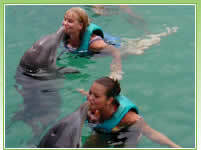 Photos will be taken of your dolphin kiss and will be available for purchase after your encounter. Guests ages 3 or younger receive free admission if accompanied in the program by a participating paying adult (parent or guardian at least 18 years of age). Guests ages 4 to 12 pay normal price and must be accompanied by a participating paying adult. 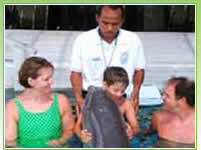 Guests 13 - 17 pay normal price and must be accompanied by an adult observer.